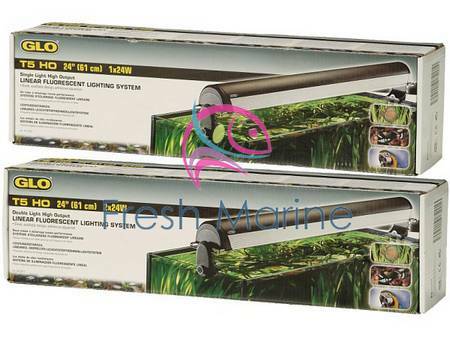 FreshMarine.com - Glo T5 HO Lighting System - Hagen Glo T5 HO Linear Fluorescent Lighting System - Buy Glo T5 HO Bulbs Now and Save! This is perhaps the most advanced T5 lighting system available! These fixtures are not only incredibly attractive but also incorporate an incredibly designed and engineered housing that directs maximum lighting into your aquarium. One of the reason the housing reflects so much light is that these fixtures have been highly polished by state-of-the-art equipment. GLO T5 HO Linear Flourescent Lighting Systems are available in three High Output formats; 24W, 39W, and 54W in both single and double light configurations. All models are equipped with a T5HO (High Output) electronic ballast, water resistant compression-fit end caps and ""mirror-finish"" internal aluminum reflector. Each lighting system comes with aquarium mounting brackets for secure installation and vertical adjustments. In addition, the fixtures include mounting legs with adjustable heights. Hagen created these wonderful fixtures with components that exceed all North American electrical codes for water resistance. 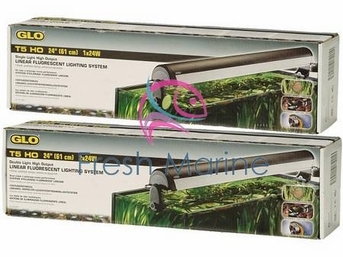 Integrated Extension Brakets - 24 watt unit fits aquariums 23 to 40 inches, 39 watt unit fits aquariums 35 to 52 inches and 54 watt unit fits aquariums 46.75 to 64 inches. Aquarium Mounting Brackets - Allows the fixture to be fastened to the aquarium and allow for 4 different vertical positions and assisting in adjusting the light levels. Integrated Suspension Tabs - Enables easy suspension over your aquarium but if not used they recess into the fixture ensuring a clean attractive look. Electronic Technology - Creates optimal bulb performance and longevity of the lamp and ballast.